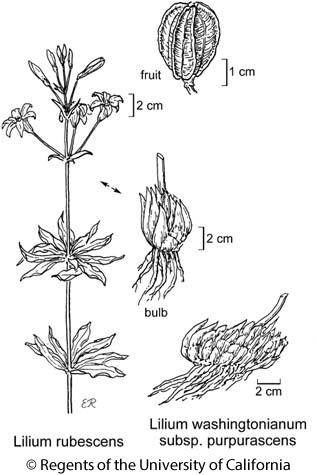 Habit: Plant < 2 m, often glaucous; bulb +- erect-ovoid, scales unsegmented, longest 4--9 cm. Leaf: in 3--9 whorls, generally +- ascending, 3--13 cm, generally oblanceolate; margin generally wavy. Inflorescence: flowers 1--40, ascending to erect. Flower: funnel-shaped, fragrant; perianth parts 4.2--6.6 cm (inner wider, strongly oblanceolate), recurved in distal 33--50%, adaxially white, turning pink-purple, magenta spots minute, abaxially often +- red or +- purple; stamens held at same level as perianth, filaments +- parallel except distally, anthers 4--8 mm, pale yellow, pollen yellow; pistil 2.7--3.8 cm. Fruit: 2--3.7 cm, generally ribbed. Citation for this treatment: Mark W. Skinner 2012, Lilium rubescens, in Jepson Flora Project (eds.) Jepson eFlora, http://ucjeps.berkeley.edu/eflora/eflora_display.php?tid=30961, accessed on April 19, 2019. NW, SnFrB. Markers link to CCH specimen records. Yellow markers indicate records that may provide evidence for eFlora range revision or may have georeferencing or identification issues. Purple markers indicate specimens collected from a garden, greenhouse, or other non-wild location.